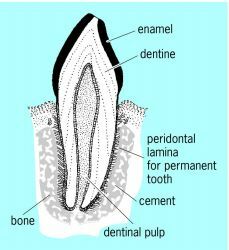 The posts protrude through the gum tissue, thus forming mounting points for firmly anchoring anything from a single artificial tooth to a complete lower or upper denture. The subperiosteal framework supports a permanently mounted artificial tooth, which is much more functional and stable than removable artificial teeth. Many dental specialists are also able to perform dental implants, a procedure in which a small metal post is inserted in the jawbone and an artificial tooth is built up and mounted on the post. A dental implant is an artificial tooth root, placed in the position where a missing tooth used to be. Mutant bacteria lacking type 1 fimbriae could not bind to an artificial tooth surface, whereas mutants lacking type 2 fimbriae attach in the same way normal bacteria. Dental implant is an artificial tooth root which is used in dentistry to support restorations that resemble a tooth or group of teeth to replace missing teeth. A dental implant is an artificial tooth root which is placed in the position where a missing tooth used to be and with appropriate oral care and regular maintenance should last a lifetime.